I've had my car for six months now getting it ready to comply with Australian registration compliance rulings. I have my Engineers meeting tomorrow morning at 9.30 and I just know that he's going to ask for proof of when my car was built. It's a 1974 L model 06927 but it has no ID plates on it and only the long stamped number in the front compartment with a star at the start and finish of the number. As this isn't an actual 17 digit VIN number, is there any way for me to prove to the engineer that my car is a 1974 model. Was there ever a documented list of serial numbers produced over certain years that I can print out to show him? "The month character seems rather random at first, until you really study it. 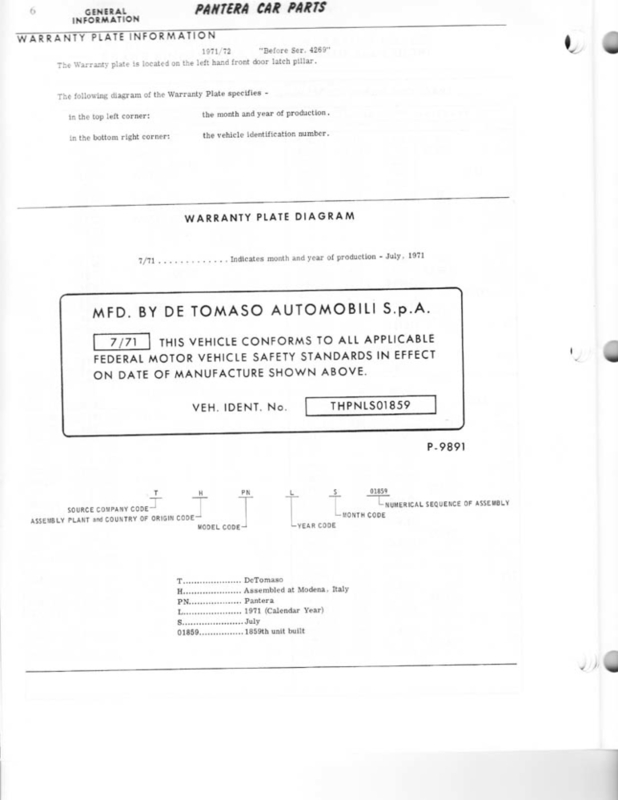 For some unknown reason, De Tomaso chose to use a 16-character repeating cycle. There is a typo in the Ford shop manual (Group 10, Vehicle Identification Codes) for April of 1971. It shows the letter "S" when in fact it should be "E" (as confirmed in the other publications). The 16-month repeating cycle is: C K D E L Y S T J U M P B R A G."
So the month is not always the same letter because it's 12 months over a 16 letter cycle. You need to work forwad from 'E' as April 1971 repetitively until you reach your year and letter. You could probably also get a Marti report, since it has all the info on it. However, you wont be able to get it by tomorrow. Mine took about 2 weeks if I remember correctly. Here are scans from the orange Ford part book. These are from an original parts book, not a copy or repo. 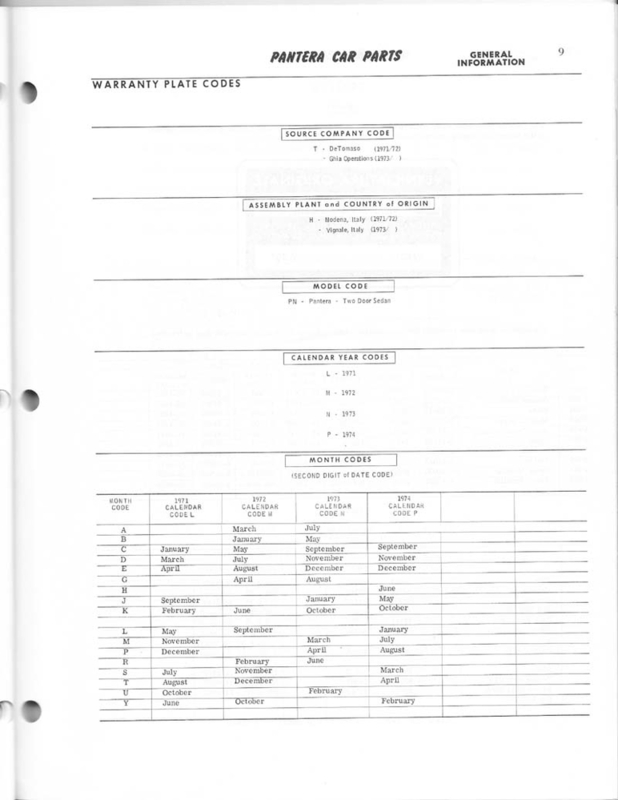 The first page lists serial numbers by year. Second page shows how to decode the VIN on '72 to '74 cars. 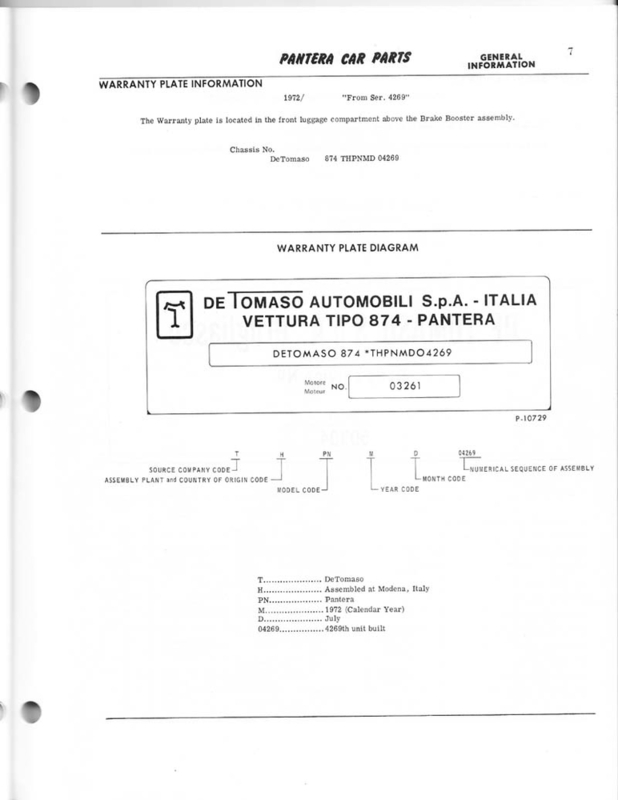 Third page shows the VIN codes including month and year. 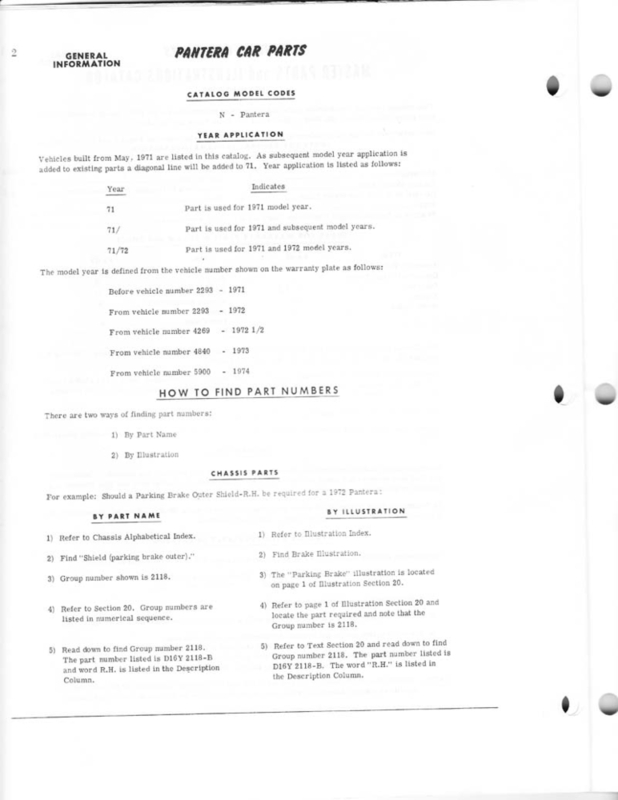 Note that there is no "S" code error for April, '71 in this original parts book. Thanks guys, you are all legends. Turns out my car was manufactured in Dec 1973 and first registered as a 1974 model in USA. I made my appointment this morning and the car is now fully certified and compliant with Australian Design Rules for the year of build. The Engineer was really pleased with the way I had set the car up, seatbelts, lighting, emmisions etc. Now just to book a registration appointment this week and I'm on the road. Did he want to see all the proof of build information? Here's the page showing the '71 only door jamb plate. It is different from the '72-'74 plate. Yes, it was actually quite important as Australian Design RUles regarding emissions for 1973 were different from 1974 so being a 12/73 manufacture actually gave me some leeway. When it was first sold new, a later date. Wow! An A pillar mounted fire extinguisher looks dangerous to me. Imagine what will happen whit your girlfriend during a collision. Wake-up! Thanks Chuck, I've contacted Provamo to register me as the new owner and allow me to update images of the car. "Wow! What idiot mounts a fire extinguisher on the a-pillar. You must really hate your girlfriend. Imagine what will happen during a collision. Wake-up!" Your thoughts echoed my own when the car arrived with a nice big shiny fire extinguisher mounted to the A pillar and right in line with my wife's blonde head, so this has now been relocated. I'm sure this makes you happy. I wonder why I can't see the page which Chuck has linked us to above. "Member Share Area access declined. In order to view this page, your account must have 'Share' access." Publicly referring to somebody as an idiot is not respectful. And the last thing I want to be remembered for is being disrespectful. You get 'share' access after you share. which explains the procedure. Since this car already has lots of photos from previous contributors your part is easy. Thanks Chuck. Email just sent with pic of chassis number and a list of recent works since the car arrived in Oz. I'm a sharing and caring kinda Guy! Going thru the history it looks like you sent in some fresh photos, and are all set up. If you have any problems, contact me, sometimes the automated process goes awry. I checked the entry, and that looks like a great car... it seems you bought it for less than it sold previously (and not long ago).